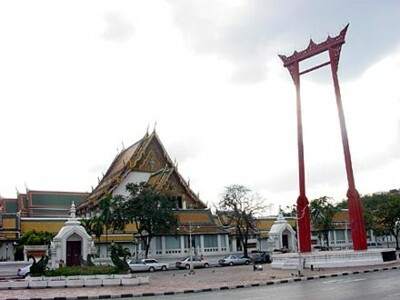 Wat Suthat (The Giant Swing) Thep Wararamworavihara is located on Bamrung Muang Road ( Bangkok). It was established in the early years of the Chakri dynasty under King Rama I, but not completed till the rule of Rama III. It is famous for the excellent murals in the main building . The doors are said to have been carved by the king himself. The Bot or Viharn (preaching hall) should be seen for its collection of gilded Buddha images. In front of the temple is the Giant Swing or Sao Ching Cha where a Brahmanic ceremony had taken place until the early 20th century. In the courtyard surrounding the viharn are many Chinese stone statues that originally came to Thailand as ballast on Chinese trading ships.